There actually does come a point where 518 rss feeds just aren't managable. Instead of trying to organize the feeds it just seemed easier to start from scratch. Now that I have a better understanding of how to use Google Reader, I can hopefullly stay more organized from the get go. My feedreader journey has been interesting. And these days I actually find myself monitoring TWITTER and other microblogging aggregators like FriendFeed, and SocialThing more often. Its more immediate and personal. My blog automatically sends a notification TWEET to my TWITTER feed, and I've seen this more and more from others in my circle. So, if I'm watching the live 140-character conversations already with an occasional "hey, I've updated my blog" in the same system...why have another system monitoring the same activities? Of course this means that if you were in my feed reader and you don't have your blog update with a tweet then I won't know about it. 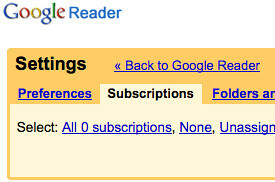 That's a bummer...but heck, nobody's in my reader anymore anyways. YOU DID IT! I'm impressed. Now I just need to get up the courage to do the same! Totally agree that 518 feeds would be hard to manage. However I use my Google Reader for easily locating articles. Often it is the first source I'll search before anything. So I've just organised myself to be very efficient using it with lots of folders. My biggest challenge is the friends feeds but I'm quite happy just to click Mark as Read since it does bring in good posts that when I'm researching to write an article come in handy. Look forward to hearing how you go with Twitter and Friendfeed. Sheer size of my twitter account doesn't make that manageable especially now Twitter Link monitor is broken :( . For me there is no immediate in twitter as my account is like a Grand Prix car speeding past.